It takes five days and more than two thousand artistic painting strokes to recreate a single freehand painted replica of many G.De.Brekht pieces. This intricate art form can only be replicated by the most talented painters specially trained in the G.De.Brekht artistic style of painting. Starting over three decades ago, G.De.Brekht developed a distinct style and established a recognizable brand and were the first to introduce a combination of distinctive wood hand-carving and multi-layer decorative painting. 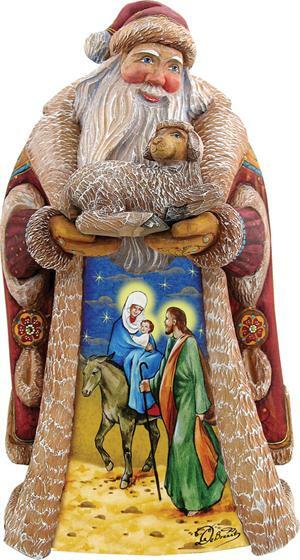 G.De.Brekht has become a trademark in the Christmas decorations field and strives to uphold the tradition of creating superior, distinguished, hand-carved masterpieces. Like legends, ballads and folk music, handcrafts constitute an essential element of a nation's culture. Wood in many variations is by far one of the most popular materials, used for generations by folk art artists, who strive to create expressive pieces with the perfect finish.